The BMP21 PLUS hand-held portable label printer combines a tough exterior with smart printing capabilities for wires and cables, terminal blocks, patch panels, flat surfaces and much more. It’s extremely rugged (protective rubber bumpers), durable (Lithium-ion battery) and easy to use (drop-lock-and-go cartridges, simple to operate, quick to print).It is the perfect solution for many industrial labelling needs, for continuous materials with a width up to 19 mm.” Tough on the outside. Smart on the inside. 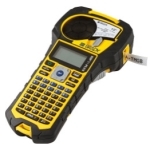 The BMP21-PLUS portable label printer takes on the toughest labeling jobs in the field. Whether you’re in a server room, servicing a breaker box or organizing your workplace, you can count on the BMP21-PLUS labeler to get the job done. And it will get the job done quickly. With smart automatic formatting, all you need to do is drop a label cartridge in, type and print. Simple. Includes: BMP41 Printer (BMP41), BMP41 Hard Case (BMP41-HC), BMP41 Rechargeable Battery Pack (BMP41-BATT), MC1-1000-595-WT-BK, M143-427, M-48-498, M-187-075-342, MC1-1000-595-OR-BK, MC1-1000-595-WT-BK, USB Cable, AC Adapter (BMP41-AC), Product CD, Brady Printer Drivers CD and Quick Start Guide. The BMP®51 label maker is a portable printing solution loaded with features for on-the-spot labeling. It includes: a large display screen, easy-to-use label design apps, fast print speed, Bluetooth technology, a versatile material selection and much more. 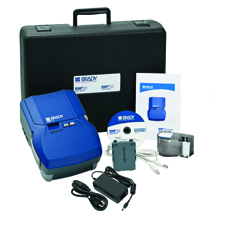 Learn more about the BMP51 printer or shop for compatible accessories and label cartridges. 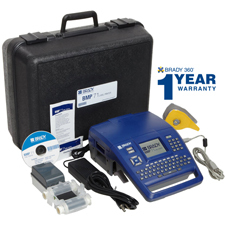 The BMP®51 Label Maker is a portable printer that can print labels up to 1.5” inches wide. 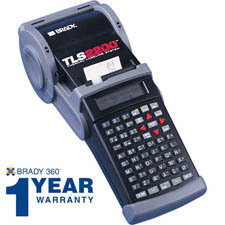 It has similar features as the BMP®53 Label Maker, except that it offers a large display screen, built-in labeling apps, and other features that allow you to create labels without being tethered to a computer or other device. The BMP®51 Label Maker prints on both continuous and die-cut label materials. With over 190 different label and tag parts to choose from, you can make sure you always have the right material for the job. The BMP53 Label Maker is a compact, versatile portable printer with built-in Bluetooth® technology for wireless printing. When used in conjunction with the free Brady Mobile App, you can design and print labels with this printer using your Android phone! This label maker has a 300 dpi print head and can print professional, durable labels up to 1.5″ wide. It prints on continuous and die-cut materials at a speed of 1 inch per second. With a built-in cutter, easy top-loading cartridges, and 3 different options for battery power, the BMP53 Label Maker is a powerful printer for on-the-job label making. Or, you can easily connect it to a PC for advanced label design with LabelMark™ Label Design Software. The BMP53 Label Maker is ideal for electrical, datacomm, facility/safety, product and panel manufacturing, and laboratory labeling applications. 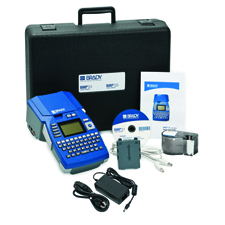 The BMP®53 Label Maker is a portable printer that can print labels up to 1.5” inches wide. This printer offers a number of features to help you get your labeling job done faster, easier and with confidence. Import Data from Microsoft Excel: Want to use data from Microsoft Excel to create labels? Simply save an Excel spreadsheet as a CSV file on your Android phone, and then add the data in the Brady Mobile app to your desired labels. You can then print the labels wirelessly from your mobile device whenever you need them. Save label files to your mobile device: Any files or label templates you create in the app can be saved to your mobile device for quick and easy label making in the future. Built-in symbols, pictograms and barcodes: Brady Mobile app features the ability to barcode and has hundreds of symbols and pictograms that you can insert onto your label files. Automatic updates (No software upgrade costs! ): The Brady Mobile app is automatically updated when new label types, printers, and materials become available. The BMP53 Label Maker’s materials are as tough as they come. They won’t fade, smear or fall off – so you only need to label something once. 16 different materials available, so you can have the right material for your specific job. Printer can survive a 4-foot drop onto concrete, harsh environments and all kinds of temperatures. The BMP®53 Label Maker offers over 130+ different stock label and tag parts. The label maker can print on both continuous and die-cut label materials; whether you need to label cables and wires or panels and equipment, you can do it all with this one printer. Store, retrieve and delete label files – save more than 100,000 label files! Character Height: 4 to 170 pt. Continuous vs Die Cut Labels: Can print both continuous and die cut labels. Handheld, lightweight and easy to use, the TLS 2200 printer lets you print whatever you want, whenever you want. And it reads the type, size and style of labels you’re using and automatically adjusts itself — without wasting material. 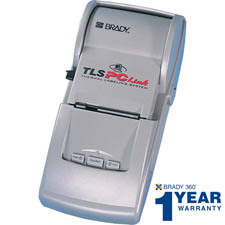 PC compatibility allows you to print directly from Brady LabelMark™ software. Now you can import lists from a spreadsheet to LabelMark and print directly to the TLS 2200 printer. This software package is written specifically for identification applications in the telecomm, electrical, laboratory and general industrial markets. LabelMark simplifies label formation through an easy step-by-step wizard; it is the perfect compliment to any TLS 2200 printer. Never be tied to one location again. Now you can have permanent, quick and crisp bar code labels whenever and wherever you want them. Resident bar code symbology: Code 39, Code 128, Codabar, Interleaved 2 of 5. Additional bar code symbologies available in optional LabelMarkTM Software. The TLS 2200 system provides continuous labeling with fixed length and banner printer options. Print up to 50 characters using the largest font size, on continuous labels up to 4 feet long, or customize the length of the label to any size you need. Autotext sizing allows the TLS 2200 printer to read your label style, select a suitable type size and register it for printing — instantly. Character Height: 4 to 72 pt. The TLS-PC Link™ Thermal Labeling System offers a rugged, small and lightweight desktop/portable solution. The printer provides capabilities such as thermal transfer printing, bar coding, and multiple material configurations. The TLS PC Link printer utilizes all of the available TLS2200 printer materials and ribbons, and also runs the latest bulk rolls of material as well. The included Windows™ drivers allow the unit to print labels from both LabelMark™ (included with TLS PC Link) and CodeSoft software, or any Windows software application available. In addition, the printer has its own printer control language, allowing the unit to be integrated with a piece of equipment and precisely printing labels wherever and whenever they are needed. The firmware is upgradeable through the mini-Din serial jack, and the unit operates off AC power or the included rechargeable battery. Printer includes LabelMark Standard labeling software, rechargeable battery pack, power supply/battery charger, R6210 ribbon, sample labels (PTL-19-423), Quick Start Guide, manuals, communications cable and Windows drivers. The TLS-PC Link™ Thermal Labeling System is a rugged portable/desktop solution. Use the power of your PC for more versatile labeling options. Versatile label options – Uses all of the available TLS 2200® printer materials and ribbons, including bulk roll material. Easy-to-use label design software – Brady LabelMarkTM Labeling Software is included with your TLS-PC Link, and CodeSoftTM Labeling Software is also available for use with this system.